The 1880s and 1890s saw the unstable ordinary or ‘penny farthing’ giving way to the chain-driven smaller wheeled safety bicycle. Mikael Pedersen – a Danish inventor who by 1893 was living in Dursley, Gloucestershire – took out a patent in the same year for a very different design of bicycle weighing only nineteen pounds. 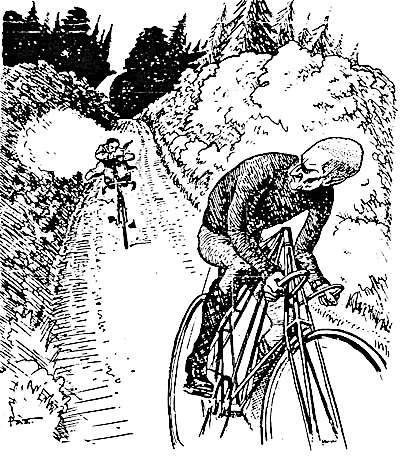 Pedersen had been a cyclist for twenty years and had found seats very unsatisfactory. He therefore developed a hammock type saddle and tried fitting this to current frames before devising his own frame to carry the saddle. The first machine had hickory wood stays, and it is said that these were bound to the joints with fisherman’s twine. All later models used metal tubing, sometimes of remarkable lightness. Pedersen did his best from 1893 to 1899 to interest cycle manufacturers in his machine, but with limited success. Critics said it lacked lateral strength, its fixed handlebar and saddle heights were inconvenient and its price was too high. However, others praised its strength, lightness, robustness and comfort. Production of machines in Dursley began in 1897, while other companies made them under licence. 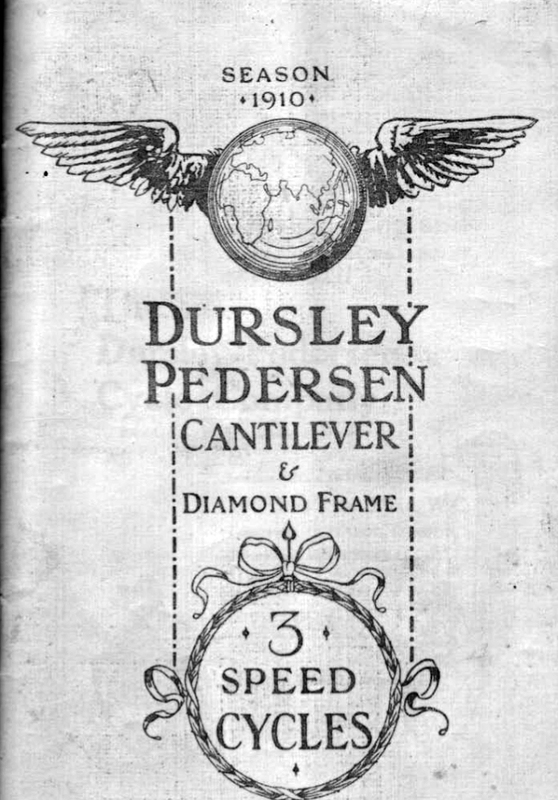 In 1899 he joined forces with Robert and Charles Lister to create the Dursley Pedersen Cycle Company. Sales never reached predicted levels as prices were always high compared to other makes – in 1903 when a B.S.A. gents bicycle could be bought for £3, the cheapest Pedersen was £17-17-0. Most machines were therefore bought by the well-to-do. Pedersen invented a 3-speed hub gear in 1902 and this was put on production models in 1903. Pedersen modified the friction clutch for over a year before he turned to toothed drive. The long delay led to voluntary liquidation in 1905 and a take-over by R.A. Lister and Co. Pedersen then had little to do with the machine but draw royalties. 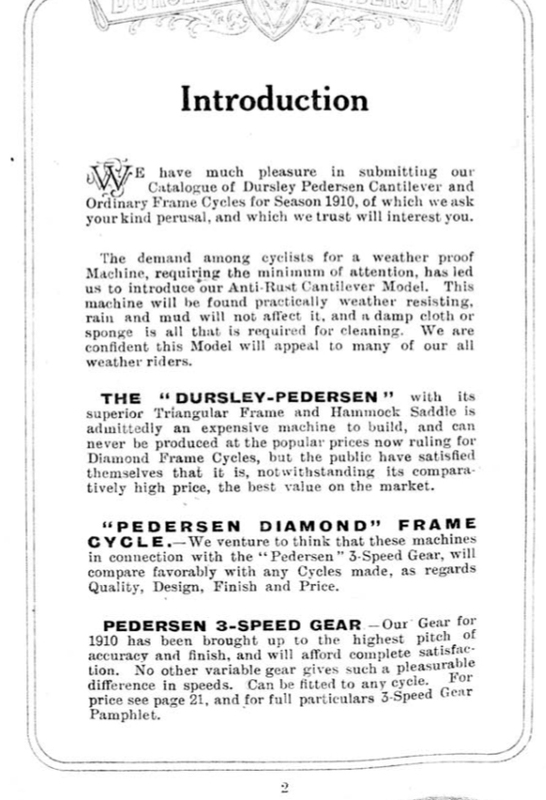 The manufacture of Pedersen cycles ceased in Dursley in 1914 although they were still sold, and perhaps made, in London until 1922. Mikael Pedersen was a brilliant inventor, but it took over a century before his famous machine was afforded the iconic status it deserves. In the 21st century the Dursley Pedersen has become one of the most sought-after and collectible vintage bicycles. But at the time – in common with most cycle manufacturers – the company was beset by financial difficulties, and marketing was made more difficult as the high cost of manufacturing made it an expensive bicycle. It had a relatively short production run, with manufacture ending in 1914. Many cycle companies ceased production at the outbreak of World War 1, most turning their factories over to war production. Of course, most of their staff enlisted, and there was a serious shortage in the country’s labour force. Sales were also obviously seriously disrupted. This combination of factors led to company failure in many instances. According to known records, Dursley Pedersen’s final batches of machines are believed to bear frame numbers up to 7800. This Cantilever machine, with a frame number of 7825, therefore has special historic significance as it is one of the latest machines known. This Dursley Pedersen, one of the final machines made, is a size No 4, ideal for a rider with an inside leg measurement around 31 – 32 inches. It was restored 30 – 40 years ago, and has been in storage for a long time. It is in good condition throughout, with a solid frame. The handlebars are similar but not exactly the same as the original pattern; the pedals are a very attractive pair of the correct period, often used on Dursley Pedersens, Sunbeams etc, but are not the original Lea Francis pedal used on most Dursley Pedersens; it is possible that they are original to the machine, as Lea Francis also stopped cycle production in 1914, and obviously customers always chose whichever pedals they preferred. The three-speed gear functions well, the saddle is sound, the aluminium wheels are in good condition. The tyres have some cracks in the sidewalls although, as you can see, they have plenty of tread and appear to have had little use; sidewall cracks and lots of tread is consistent with long-term storage. Although I purchased this 1914 Dursley Pedersen because of its historic significance, I already have two DP’s in my personal collection (a 1900 being restored and a 1913 fitted with a Wall Autowheel). So it will reluctantly be offered for sale for a fellow enthusiast to enjoy.